2. How Do Cities Address Issues Arising from Accelerated Urbanization? "The World Bank in the Era of Connected Cities"
"Making Cities More Livable in Asia and the Pacific"
"JICA's Initiatives for a Sustainable City"
"Hitachi's Social Innovation Business Contribution to the Sustainable Development Goals"
NAKAKITA Kojin, Chairman of Hitaci Asia Ltd. and Chairman of Hitachi India Pvt. Ltd.
"Mitsubishi Electric's Water Distribution System Contributing to Water Conservation-conscious City"
"JFE's Technologies to Support Sustainable Cities and Communities"
"KUBOTA's Activities for SDGs - Past and Future - "
"Overseas Development Promoting Business of the Urban Renaissance Agency (UR)"
"NEC's Footprint and Outlook in Urban Transportation"
The 12th Asian-Pacific City Summit was held in Fukuoka City during the period of August 1–2, 2018, co-organized by the United Nations Human Settlements Programme (UN-Habitat) Regional Office for Asia and the Pacific. The Summit was attended by representatives of 32 cities from 16 countries. The Asian-Pacific City Summit was established in 1994 under the advocacy of Fukuoka City, 11 Mayors Conferences and 10 Working-level Conferences have been held so far. The Asian-Pacific City Summit has seen successful results by sharing challenges faced by cities and initiatives to address them, stimulating mutual cooperation, and promoting economic exchanges. By utilizing the network, cities in the Asia-Pacific region have strived to achieve balance and sustainable development by promoting mutual understanding, friendship, and cooperation around the world. At present, around 55% of the world’s 7.6 billion people live in urban areas. This ratio is predicted to reach approximately 70% by the middle of this century. The Asia-Pacific region has especially been experiencing urbanization at an unprecedented scale and pace. Cities have a number of responsibilities including: managing the urban environment, facilitating adequate transport and the provision of water. Furthermore, cities should implement measures that directly impact the day to day lives of their citizens, such as measures for women, health, education, and disaster prevention. Cities are therefore essential partners for national governments in implementing and achieving all 17 of the Sustainable Development Goals (SDGs) adopted at the United Nations General Assembly in 2015, and their roles and responsibilities are significant. Within this context, cities need to develop new policies to: accommodate aging populations, protect citizens from increasing disaster risks caused by climate change, and address the increased stresses on the environment and transportation caused by rapid urbanization. Cities should strive to work with the private sector to find new ways to use innovative technologies such as ICT, IoT and AI to address these challenges. 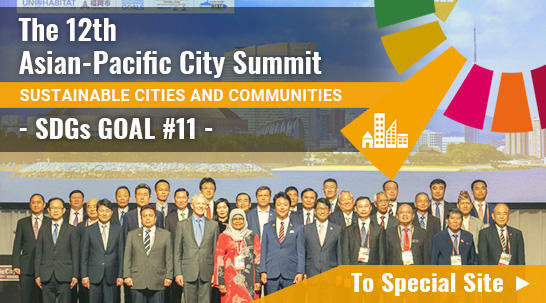 With recognition of the SDGs at the forefront, participants from cities, the United Nations, international organizations, and innovative tech focused companies shared best practices and engaged in discussions on developing “Sustainable Cities and Communities”, the theme of the 12th Asian-Pacific City Summit. Participant cities deepened mutual friendships, developed new networks with international organizations, and gained insights into utilizing advanced technologies and practices to facilitate sustainable urban development. During this two-day program, participants acknowledged that actions taken on the city level in urban environments contribute to global issues such as climate change and disaster/risk management, and thus solutions on the city level are key for a sustainable Earth and better future for the Asian Pacific Region. Participants also acknowledged that leadership by the mayors of each city is essential for the resolution of ever-increasing and more complicated urban issues. This mission and responsibility is not only for the cities but for a better future for planet Earth they are working towards as city leaders. At the closing of the 12th Asian-Pacific City Summit, we hereby adopt the following “Fukuoka Declaration”, in the hope of contributing to solutions to address global issues and urban challenges. We aim to promote the further sustainable development of Asian-Pacific cities and will utilize international inter-city networks to do so. 1. Asian-Pacific cities shall continue to respect each other, promote exchanges and cooperation for the sound development of cities and the advancement of urban policies in the spirit of mutual assistance, and enhance inter-city networks, which serve as a platform of urban development and policies. 2. Asian-Pacific cities shall make use of the lessons learned from each other through inter-city networks and international conferences to continue to improve their cities’ urban environments and not duplicate mistakes. This offers useful insight into not only other cities’ initiatives, but also global trends, and their partnerships with the United Nations and other international organizations. Asian-Pacific cities shall work to advance sustainable urban development and social progress by utilizing their cumulative knowledge and experience, and actively adopting cutting-edge technologies. 3. Asian-Pacific cities shall aim for sustainable and harmonious urban development in cooperation with each other, and in recognition of the SDGs, while continuing to encourage further economic growth. Asian-Pacific cities shall continue to develop their cities to strike a balance among people, the environment, and urban vitality, and contribute to solving global issues where they can, and shape a better world for future generations, by preserving and protecting the environment, reducing poverty and inequality, facilitating quality service of education, medical care and social welfare, and achieving meaningful social inclusion. 4. The Asian-Pacific City Summit shall, through its activities, showcase the efforts of Asian-Pacific cities in implementing and realizing the SDGs and demonstrate the significance and substantive outcomes of global inter-city partnerships to the world. 5. The 13th Asian-Pacific City Summit shall be held in Fukuoka City, Japan in 2020.